Providing quality, affordable child care to the local community. Take a look around to learn more about Mes Bach-Little Acorn. Mês Bach - Little Acorns offers quality, affordable childcare for children 2-l2 years. We run a Pre-School nursery for children aged 2 to school-age, an after school club, holiday club and a Toddler group once a week. We operate from a purpose built facility in the grounds of Comins Coch Primary School. Although we have close ties to the school, our services are open to all, not just pupils or prospective pupils of Ysgol Comins Coch. Our staff are all trained, qualified and experienced. The day to day running of Mês Bach is in the hands of a manager who looks after the staff, the children and the facility. As a charity Mês Bach - Little Acorns has a committee who meet at least once every half term. They take advice from the staff, ensure the legal status of Mês Bach, arrange fund raising activities, and care for the long term future of the charity. All parents/carers of children who use Mês Bach - Little Acorns are automatically members of the charity, have a vote on charity matters and are eligible to sit on the committee. We encourage all parents/carers to be as involved as possible with the running of Mês Bach - Little Acorns. You may feel a little bit nervous as you prepare to leave your child for the first time, you are not alone, all parents feel the same. We provide a safe, stimulating and loving environment. 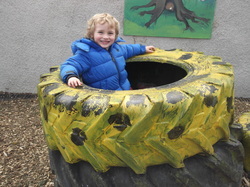 Settling in to our nursery is important so we offer a free taster session, for you and your child to get to know staff and get used to the environment. This session also helps us to get an overview of your child's needs. Dilynwch yr holl bethau cyffroes yr ydym yn ei wneud yn Mes Bach. Mes Bach - Little Acorns is now on Facebook. Follow our day-to-day activities as well as news, offers and announcements - Click ﻿﻿here﻿﻿ to take you to the Facebook page.